Portrait of a Lady is a popular perfume by Editions de Parfums Frédéric Malle for women and was released in 2010. The scent is floral-spicy. Projection and longevity are above-average. It is being marketed by Estēe Lauder Companies. As almost always, the combination of spices and woods was successful. This already has a recognition value as to how the open, soft overall impression is created. The rose contributes its waxy smoothness without ever appearing vegetable fresh. There are also strong carbon moments. The master shows his skills. How can you not like such a thing? Overall, however, the impression is that of heavy curtains, a sadness turned away from the world by migraine. Away from the demonstration of just skill, which is right and cheap to admire, I would hardly want to carry this perfume around with me every day. The fragrance is also too heavily dosed for this and does not retreat like a classic "extrait" with a higher concentration. I suppose, without conveying the background of price, ambition, ultimately the sad story in the quoted book, one would quickly be identified as Muffonkel/tante. Birkenstock sandals, brocade jacket, carrot cake? Carven, MaGriffe should have a less delimiting effect in this respect, although they are abundantly old-fashioned. Mrs Cade would probably have laughed if she had been given the title Lady. She would probably have burst out laughing if she had been associated with a perfume. And yet this woman was so extraordinary and her dream she realized so incredible that it is a pleasure for me to call her in one breath "Portrait of a Lady". Rowena Cade bought the Minack promontory for GBP 100 in the 20s and built a house for her mother and herself. In 1929 "A Midsummer Night's Dream" was performed in the open air for which she designed the costumes. The performance was successful, ran for a long time and so they looked for a suitable place for further plays, whereupon Rowena Cade suggested the cliffs below her garden. (Who knows the local conditions, knows that this was an unimaginable, daring suggestion.) Rowena Cade and her gardener Billy Rawling began working alone on the rocks in the winter of 1931/1932. Granite and earth had to be removed to create the stage and grandstands of the Minack Theatre. The first piece that was performed was "The Storm" by Shakespeare - and it was so successful that it was even mentioned in the Times. For the lighting of the piece, car headlights were used and the tickets were sold at a wallpaper table. Over the years the Minack has been steadily built and Rowena's plans have not yet been fully implemented. She herself cast the pillars and seats out of concrete, sand and granite and scratched the names of the listed pieces into the terraces with her own hands. Plants were planted in the rock crossings and so the Minack still represents a symbiosis of theatre and rock garden. After the Second World War the theatre was reopened and since then has existed with great success as a lay stage for actors and musicians. This truly great woman - who resembled more the forest spirit of Puck than what we imagine of a lady - has realized her vision, her life's dream, to create a truly unique and beautiful amphitheatre in her own physically hard work, without much outside help, also financially. I had never seen theatrical passion of this magnitude before and it was a celebration for me. I'm sure Mrs Cade would have liked "Portrait of a Lady." This is not a tricky lady fragrance, not so full of elegance that you have to spread your little finger when lifting the bottle. This is a solid, hands-on perfume that reflects the scents of nature. "Portrait of a Lady" is not a fragrance for sensitive people who only want to smell like a hint of anything. It demands and it exists. The lady can give clear instructions, gets to the point and even more to the point. It cannot be delegated or exploited, it has its own head. You only smell incense? How boring! With the prelude I connect the smell of pine needles, not with sacral incense. And the jaw as a singular is wrong. Pine, here you go. A whole wood of it and some patchouli. Balsamic, heavy, dark and nevertheless with fog and morning light. Just a little melancholic, just a little earthy. I wish I had the scent of a coniferous forest. In my opinion, only the roses would have managed without the strengthening raspberry aroma. More rose, less raspberry, a dream hard to fulfill. But I find the clove in between very clever. This gives the rose/raspberry hybrid another special twist. And lo and behold, the incense no longer smells like KieferN, but rather hits the smell of cypresses more cautiously. From the Sillage the lady is pregnant and the durability covers times a whole day. I don't see the perfume as a purely feminine fragrance. When I sniffed the scent on a scent strip for the first time, I was as if enchanted. It smelled like fruity spicy roses with lots of green and some musk - delicious ! After a short while (approx. 15 minutes) the woody-smoky is added... My skin absorbs woody and smoky things enormously well, which usually throws the other components mercilessly out of the game.. So the fragrance stays with me for hours! Perfumer Dominique Ropion and Frederic Malle get on with each other quite well, which can be proved by at least 5 scents from the serie Editions De Parfums: Carnal Flower, Geranium Pour Monsieur, Une Fleur de Cassie, Vetiver Extraordinaire and the most popular one among the true connoisseurs of perfumes Portrait of a Lady. Those who are more familiar with Frederic Malle’s offer know that most of Ropion’s scents are usually those graded the highest and the most marketable ones from all the others launched by this exceptional and exclusive brand. I’ve tested this fragrance when i was just entering the Niche world,so it was pretty much a shocking experience for me. Because Portrait of a Lady is a love or hate scent,for me ar least. So,at first i found it strange. Was so cold and so untouchable,a perfume more towards unisex than ladylike,with such a selfish vibe,was almost screaming ‘leave me alone,don’t touch me’. Of course back then i left it rot in a box,wasn’t for me. I received these days a decant from a non reformulated bottle. Rose-patchouli combo,with a slight touch of raspberry,totally drowning in incense. Same cold incense i remembered from the first encounter. I don’t like this fragrance. Makes me feel very uncomfortable,and why lie,makes me pretty sick too. With a longevity of least 10 hours,a pretty strong sillage and a truly unisex vibe,Portrait of a Lady is perfectly wearable by a man also. It is not a jammy rose scent,not even fit for a young woman in my opinion,this is not for me. I totally refuse to wear or even smell it. I had only one experience like this. With Fracas Piguet. Of course they are not even remotely alike,but it gave me the same bad feeling. But it has its lovers. Which i absolutely admire. This is not a bad fragrance,not at all,but i believe this is a stone cold hearted one. You can find this mix at every step of the way in the perfume world,but this here is pretty much one of a kind.Conclusion: i don’t like it and i hope not to ever smell it again. The rose and patchouli pairing is such a good fit that it seems like proof of fate. It’s been the basis for a range of leathery, ambery, woody and mossy perfumes spanning woody-floral, chypre and oriental genres. The Malle PR boasts that Ropion used surpassing doses of rose essence and patchouli coeur, a fractionated patchouli. Fractionated naturals are botanical materials that have been separated into their constituent parts by chemical and physical processes, especially molecular distillation, and edited to remove undesirable traits. Around the time of Portrait’s launch more and more of these ‘tidied up’ botanicals were becoming available. Well understood materials like vetiver, cedar and patchouli saw their challenging attributes reduced or removed, leaving frictionless, blissful versions of the materials. They were sanded, polished and lacquered. Aroma materials manufacturers were pushing their hot new high-tech, stripped-down botanicals. They were an easy sell. They used a version of the best-of-all-worlds tactic to sidestep the endless botanical vs synthetic debate. They are ‘natural’ and therefore good but they have also been made better through chemistry and are therefore contemporary. Used thoughtfully, fractionated botanicals allowed a measured, precise tailoring of olfactory effects. Unfortunately they also made their way into some simplistic compositions that smelled like ‘easy listening’ perfumes. The niche and mainstream markets of the time were top-heavy with a glut of radiant, synth-woody fragrances. Many perfume buyers had become accustomed to judging the quality of a perfume by how closely it approximated the properties of woody amber materials. These scrubbed versions of botanical materials matched the tone created by woody ambers. An entire fumie cohort was conditioned to respond to the ‘clarity’ of the new generation of fractionated botanicals. Distillation of materials is not new to perfumery by any means. The recent emphasis on fractionating well-understood botanical aroma-materials stems from the attempt to dissect IFRA-designated toxic materials such as lavender, lemon and the notoriously virulent tea leaf and remove their noxious bits. Think of a fraction as a potent material that has undergone an exorcism. Rose and patchouli have complementary facets that fit like a lock and key and have strong synergy. The camphorous chill of patchouli acts like an astringent to rose, keeping it from settling into the dull beauty that an uninspired rose perfume can have. Rose’s berry notes become wine-like and boozy when paired with patchouli. Resinous materials give rose a honeyed drawl and musk keeps the bloom on the rose. Camphor, berry notes, musk and amber are the olfactory attributes emphasized in coeur de vetiver and Ropion uses them along with incense, benzoin and god only knows what else to create the durable accords that allow Portrait of a Lady to last for days. It is classically Ropion in that rich natural materials and potent synthetics are focussed on the same goal: coherence. The perfume’s sillage and forcefulness hint at potent synthetics. Happily, though, the ear-ringing, gut-churning feeling I associate with over-reliance on particular synthetics to give radiance and endurance is nowhere to be found. Portrait of a Lady showcases Ropion’s exceptional capacity to calibrate synthetics toward specific compositional ends while avoiding their side-effects. Since 2010 when it was released, Portrait of a Lady has come to stand toe-to-toe with an equally imposing patch-rose, Aromatics Elixir. While AE dominates the mossy/chypre side of the rose-patch hoards, The Lady has become the standard against which woody and oriental side of the rose family is compared. Rose-oud as well. It’s a perfume that begs to be described in superlatives and worn with abandon. Portrait of a Lady starts a little harsh, but settles down very nice and quite soft. The sillage is big and the longevity is extremely good. I mainly detect rose, patchouli, incense and fruit with a clove and cinnamon kick. It's fresh, but not sour (maybe a little sourish, but not the usual disturbing kind) and there also is a bit of sweetness in there. I've read somewhere that it's very similair to Montale's Black Aoud and I agree. But where Black Aoud is linear (the initial notes are indeed comparable) Portrait of a Lady changes and has so much more facets. If you disregard the name this could easily be unisex and therefore also be worn by a man. If this is a PORTRAIT OF A LADY, the lady in question is well past her prime, if not dead. Her apartment is littered with tchotchkes and dried curling roses, an expired potpourri. The only compliments you're likely to receive while wearing PORTRAIT OF A LADY is that you look so young... for someone who smells so old. While there is undeniably a rose note present, the note is a present to no one nearby. This is not a bright young rose, not a fresh bloom, not sun-soaked, nor green earth and thorns, no. In PORTRAIT OF A LADY, you'll find no signs of life... or lady. Portrait of a Lady starts with a sublime mixture of rose, incense, wood and a hint of raspberry in the background to support the rose and incense, with patchouli growing through the dry down to mix with the incense as the rose recedes. It is rather linear, but when the scent smells this good, that is a very good thing, IMO. The sillage and longevity here are absolutely spectacular (my one spray lasted well over 30 hours at near full strength and sillage on skin) and the scent smells even better from a distance. As for classification, I don't know why this is marketed as a feminine scent, as I definitely think it is unisex and if someone said it was targeted as a men's scent I would have been far from surprised. The only drawback is the cost... I went on a top recommended fragrance testing binge in Vegas, and only put a couple favorites on skin. Portrait of a Lady won out overall, but when I came back to Barney's to make the purchase it turned out to be $210 for a 50 ml and $300 for 100 ml (now it costs even more). Ouch! I ended up still buying the 50 ml after thinking it over some more, because it really is that good and unique. Finally, as people have mentioned in other reviews, this one is potent and one spray will almost assuredly get the job done... Go easy on the trigger folks! A BIG thumbs up for this five star winner from Ropion that is my new favorite scent overall. ... but as far as I'm concerned she can protest all she likes!! WOW!!! There is a really good reason I love Dominique Ropion's work ... the man is simply a genius!! This 'portrait' is not of a demurely clad Monet-esque maiden reading innocently in a bower of trees, she's a Rubens-like scantily clad Delilah ... demanding Sampson's head on a platter after having her way with him. Actually, I think this gal is a Drag Queen, cast in the mould of a lewd and loud Mae West :). A fragrance for a big personality, that could probably asphyxiate those within a six foot radius should the trigger not be handled gently ... just the way I like it!! An astounding Patchouli is given a spicier twist with the accompaniment of clove in the top, the Rose here commencing as a faint floral whisper and crescendoing to a sweet, dark roar. Sandalwood and Frankincense really sing in the heart here too. Portrait of a Lady is an astoundingly modern fragrance, whilst retaining a certain 'olde-worlde' charm with it's almost irreverent power. I'm pretty sure that there is a little Oud here, even though it's not listed. It may well be a combination of the Sandalwood and Resins, but there is a similarity here to Montale's Black Aoud. There are also overtones of Ropion's Costume National Homme in the sweet and spicy nuances that this creation emanates. Portrait of a Lady is definitely unisex in my book ... after all ... what's in a name? Definitely one to own!! After the blaring, elephantesque opening of Frédéric Malle PORTRAIT OF A LADY, I was not surprised in the least to learn that the perfumer was none other than Kenzo JUNGLE L'ELEPHANT creator, Dominique Ropion! Huge opening with a massive blast of patchouli along with incense and rose. The spices are quite a bit tamer here than in L'ELEPHANT, but this is still much more of an oriental than a floral perfume to my nose. I would compare this composition to Juliette Has a Gun VENGEANCE EXTREME, except that PORTRAIT OF A LADY is much sharper (partly due to clove?) and more declarative, even intense. They definitely occupy the same general neighborhood on the grand olfactory map. 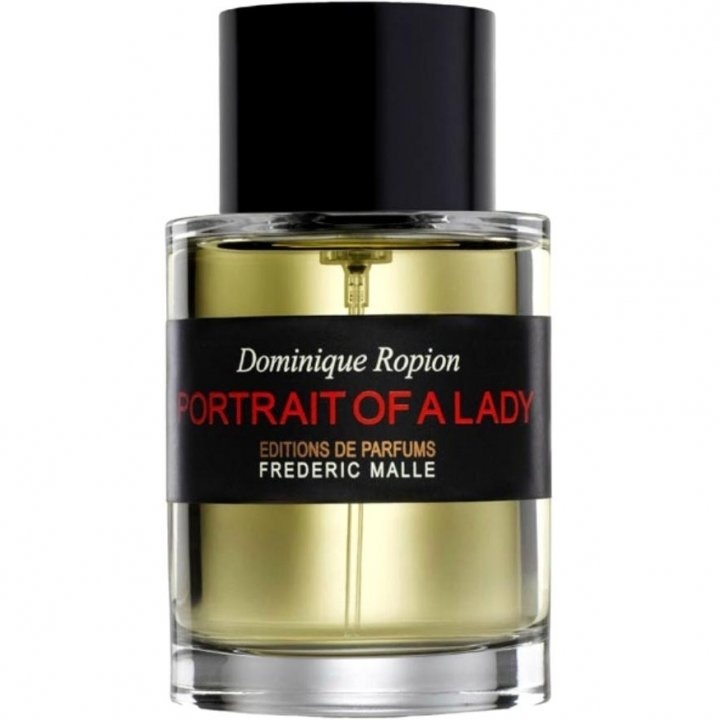 PORTRAIT OF A LADY is much closer to VENGEANCE EXTREME than to either LIPSTICK ROSE or UNE ROSE, the other two Frédéric Malle rose perfumes. The longevity is great and the sillage big enough to make this a wear-at-home-only perfume for me. Very voluptuous and, frankly, unladylike in its brazen, almost animalic sensuality. I like it a lot, I really do. This is a no-holds-barred oriental patchouli perfume with some rose accents. Seems omnisex to me. I once did roofing for a poor family in the hills of Tennessee and their house stunk like this. Old body odor, mold, and rotting wood. I have no other way to describe the memories that come flooding back from this perfume. Lovely scent. Can't go wrong with this one.